As a claims management professional, you have to deal daily with formidable - and sometimes competing - challenges: provide superior customer experience; achieve operational excellence and cost containment; and effectively manage risk. Predictive analytics can help you improve each of these three outcomes, but more importantly, it helps strike the right balance among these three objectives for each new claim received. 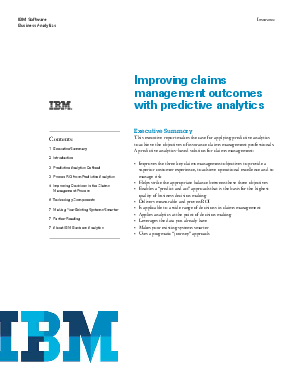 Read this white paper from IBM to learn about applying predictive analytics to claims management, including the typical ROI achieved, how embedded analytics improves decision making, and technology components of a predictive analytics solution.